Add beef to a skillet over medium-high heat with red pepper flakes, salt, pepper, fish sauce, and brown sugar. Cook until beef is browned and cooked through, about 8 minutes. Keep beef warm until serving. For slaw, shred cabbage finely and dice the jalapeno and cilantro. Combine in a medium pot over medium heat with minced garlic, soy sauce, fish sauce, brown sugar, lime juice, and 1/2 cup of water. Cover, and simmer for 4 to 5 minutes until cabbage is tender. Then remove from heat and let cool. 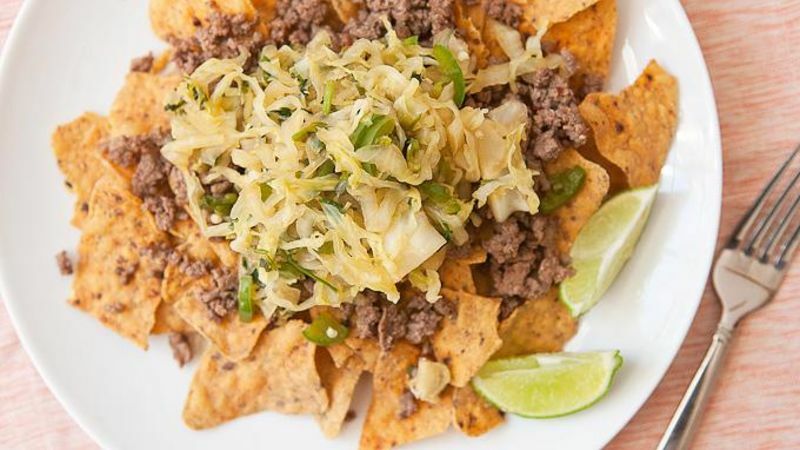 To make nachos, spread veggie chips out on a large serving plate and top with cooked ground beef mixture. Top nachos generously with cabbage slaw and serve with extra limes and/or hot sauce on the side! These easy Asian-inspired nachos will have your foodie friends reaching for more. If you ever told me I'd make a nacho recipe without cheese on it, I would say that I must’ve been abducted – before I tried this recipe, that is. I mean ... nachos without cheese just doesn’t sound right. So you’ll just have to trust me on this one. When you start with some flavorful chips and top it with savory beef and a Vietnamese-style cabbage topping, you’ll have so many interesting flavors going on that you won’t even miss the cheese. When they're gone though, you’ll miss these Vietnamese Nachos. I added some browned and seasoned beef to give them some protein and heft. Without it they'd still be a fine appetizer, but would be a little light for a meal. Cooking the beef is easy enough. Just combine the ground beef, red pepper flakes, salt, pepper, fish sauce, and brown sugar in a skillet and cook it until the beef is browned and cooked through. The real secret to this recipe is the cabbage mixture. I now it sounds crazy, but it’s really just crazy addicting! The key is to be sure and shred your cabbage finely and dice the other ingredients finely as well. Add the slaw ingredients to a medium pot over medium heat and bring it to a simmer with about 1/2 cup of water. After 4-5 minutes, the cabbage will be tender. Don’t overcook it at this point -- just remove it from the heat so it can slowly cook. This was my finished cabbage. Don’t worry if there’s some extra liquid in the pot, just be sure to strain it off or it’ll make your chips really soggy! For the chips, I used some Green Giant Vegetable Chips. Just a heads up, these are delicious. Don’t open the bag until you want them gone! Then just pile on your beef and cabbage mixture. Serve some limes (and maybe some hot sauce on the side) and chow down! Vietnamese Nachos. They are a thing. Nick retracts his previous statement that all nachos need cheese! Check out his blog, Macheesmo, and follow him on his Tablespoon Profile.